This week, check out the legacy of the Department of Tropical Research Field Expeditions at the Drawing Center through a series of nature drawings that date back over a century, then speed into the future and explore androgyny at Prince Street Project Space. Amanda Marie’s Darger-esque pieces open at MARCY Projects, and The Corp shows off an exhibition made over one hellish evening. Art group The Happening is back for an evening to raise money for Planned Parenthood, and you can go goth to support the blog Art F City. 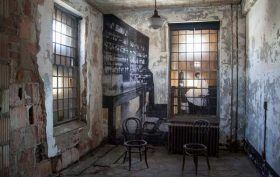 Finally, grab a hard hat and explore the abandoned Ellis Island Hospital with Untapped Cities, then dive into a bag of popcorn as the Tribeca Film Festival comes back to town.